Ever since Topps regained the WWE trading card license in 2005, they've focused primarily on low-end products with accessible price tags. 2015 Topps WWE Undisputed is the first truly premium wrestling card product. It takes things to the high-end, delivering an autograph or autographed relic in every pack. For every ten-pack box, seven of the hits are autographs. These come in a few different forms. 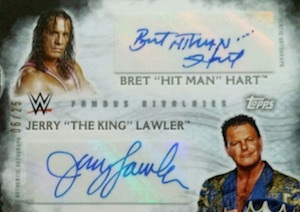 Undisputed Autographs feature current WWE Superstars and Divas as well as retired (at least as much as one can be in the business) Legends. NXT in Line Autographs feature signatures from talent in the WWE's feeder program. Both Undisputed and NXT in Line Autographs have Black (#/50), Purple (#/25) and Gold (1/1) parallels. 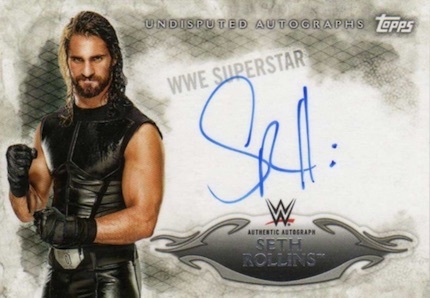 2015 Topps WWE Undisputed has a handful of limited premium autograph inserts. 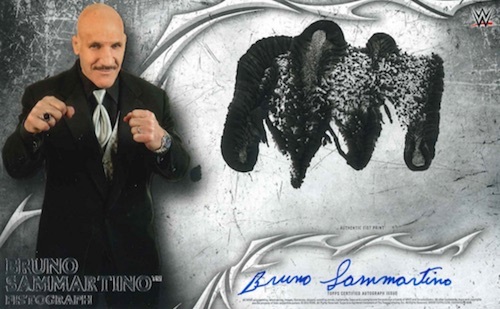 Famous Rivalries Dual Autographs (#/25) use stickers to showcase signatures from a pair of wrestlers who have faced off over the years. Four Corners Quadragraphs (#/10) are book cards that come with four autographs. Undisputed Cut Signatures (1/1) come with a signature embedded into the card. Fistographs (#/10) are brought over from UFC for the first time. Randomly inserted as box toppers, these over-sized cards have both an autograph and an inked fist print. Undisputed Autograph Relic cards come with a signature and a swatch of an event-worn shirt. Like the Undisputed Autographs, these have Black (#/50), Purple (#/25) and Gold (1/1) parallels. Famous Rivalries Dual Autograph Jumbo Relics (#/5) are book cards that have two autographs and a pair of over-sized relic pieces. The 2015 Topps WWE Undisputed base set is a mix of 100 current stars, Divas and Legends. To fit with the premium nature of the product, they're printed on thick card stock. Parallels include Red, Black (#/99), Purple (#/50), Silver (#/25), Printing Plates and Gold (1/1). Collectors can also look for a trio of basic inserts. NXT Prospects high future WWE stars. 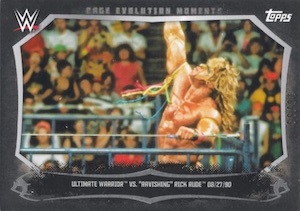 Cage Evolution Moments explore the history of WWE cage matches. Famous Finishers use action shots of some of the most popular finishing moves. Basic inserts have a similar parallel structure and quantities as the base set. 35 cards. View a detailed guide and gallery. 15 cards. View a detailed guide and gallery. 14 cards. Hand numbered #/10. So I’m guessing there will not be any Hulk Hogan autographs due to the recent story of WWE cutting ties with him. Have to get guys like Hogan, Bret Hart, Razor, The Rock, Stone Cold, HBK, Mick Foley, Foley Characters Triple Auto, Triple H, Quad Signed D-X, Undertaker, Kane, Jericho, Rock/Ken Shamrock Dual, Quad Signed McMahon family, Austin/McMahon Dual, Bautista, Cuts of Andre, etc to work and justify the price. The Topps model of Cena, a few chicks and 6 Jobbers ain’t gonna work in this case. And you have to have Hogan, you have to. No way around it. I love this set!!!!!!!! I bought 3 boxes and got so many great autographs!!!!! AMAZING!! This is the first time I have ever bought wrestling cards. I watch it once in a while so I am a fan. I gotta say that this product is well worth it. Very fun to open. The card stock is awesome. The autos are very fun to see. Most are on card and a lot of big name guys. I am probably going to get more boxes. Thanks Topps for a great product! I gave it 3 star because there should have been more stars like Hogan,Andre the Giant,The Rock, for the price. 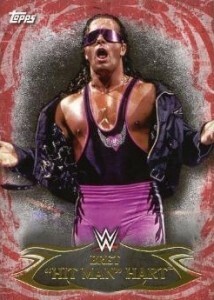 I collect and sell wrestling cards the box price is to high. Love the cards. Great quality, awesome autographs & relics. I got some of my favorite wrestlers; current (like Enzo Amore, Cena, Nikki Bella) and all-time greats (HBK, Razor Ramon). My only concern/complaint is the price. It either needs a few more big names thrown into the mix (Mick Foley, Stone Cold, The Rock, etc), or bring the price down.